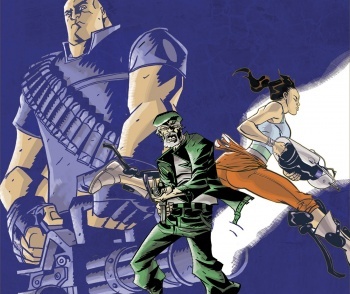 Dark Horse Comics' latest solicitations include the announcement of a collection of comics based on Valve Software's beloved gaming series. Like peanut butter and poor analogies, videogames and comic books are two great tastes that go great together. It's increasingly common to see gaming publishers and comic book creators join forces to craft comics based on famed virtual worlds, and the benefits are obvious: The universe gets a convenient expansion, and the comic's creators get exposed to an audience they might not reach otherwise. These aren't simple one-off, disposable marketing gimmicks however, as evidenced by Dark Horse's newly-revealed collection of comics based on Valve Software's catalogue. The 304-page, hardcover book goes on sale November 16 for $30. I've read "The Sacrifice," and for what is essentially glorified Left 4 Dead fan fiction, it's a phenomenal story. The art is of excellent quality, the writing elicits the same feelings of dread and isolation as the game, and the violence is right on par with Valve's zombie shooter. That said, I have no point of reference for the Portal and Team Fortress comics. I'm going to guess at the existence of duplicitous baked goods, but otherwise that section of the book is a question mark. Speaking of question marks, and as much as I love the three games covered in this tome, can anyone explain to me why a comic book omnibus based on Valve Software games features no Half-Life comics? Gordon Freeman's adventures may lack the kinetic bombast of Team Fortress or the cerebral undertones of Portal, but I would pay cash money to see a Rob Liefeld take on everyone's favorite theoretical physicist. Just imagine how many extraneous pouches could fit on the HEV suit!